Thank you, Chronicle Books and Beth Kephart, for preparing to release another of Beth's beautiful novels into the world! The book itself is a nest of treasure with rich imagery, lyrical language, metaphor, and winged flights through the city of Florence. 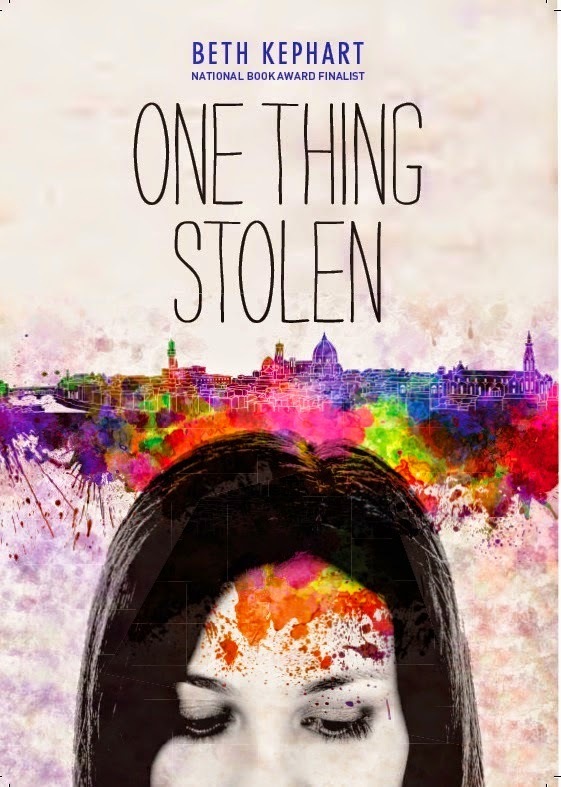 Nadia is trapped in theft, a loss of words, and a loss of reality while she repeatedly loses consciousness during her family's relocation in Italy. And there is a boy, a boy whose hair glows, who leads her through the streets of Santa Croce, and there is a best girlfriend, who will give all to find him again for Nadia, never losing hope for her. Keep this one in mind, readergirlz. You'll have a wait for its release. But isn't Beth always worth it? Although Mitsi Kashino and her family are swept up in the wave of anti-Japanese sentiment following the attack on Pearl Harbor, Mitsi never expects to lose her home – or her beloved dog, Dash when she’s forced to move to an incarceration camp. 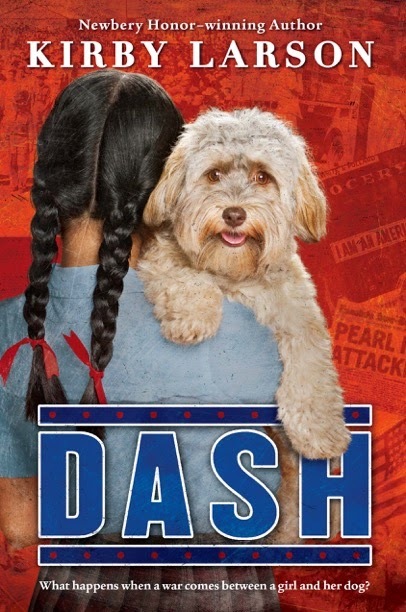 Kirby Larson swings by readergirlz to chat with Janet Lee Carey about her new middle-grade novel, DASH. JLC - Welcome Kirby. Congratulations on your new historical fiction book and on the 2014 National Parenting Publications Gold Award (NAPPA) for DASH! KL – Thanks, Janet! It’s an honor to visit with you. And I am so delighted about the NAPPA award, as well as the two starred reviews, for my new book. JLC - Tell us what inspired you to write Dash. KL – I grew up on the West Coast and did not learn about the “evacuation” of 120,000 people of Japanese descent – most of them American citizens – during WWII until I was in college. I was shocked that something of that magnitude could have been omitted from my education. So I began to try to learn as much as I could about it; when I became a writer, I wanted to tell stories from that time period in hopes that no other child would grow up in ignorance about that shameful slice of history. One of the texts I read, Strawberry Days by Dave Niewert, had a short snippet of an interview with a woman named Mitsue Shiraishi, who told about being so heartbroken at the thought of having to leave her dog behind during the “evacuation” that she wrote to the man in charge, General John DeWitt, asking for permission to take her beloved Chubby to camp. He said “no,” so now Mitsi had a few days to find a home for Chubby; fortunately, a kind neighbor, Mrs. Charles Bovee, agreed to take him in. Mrs. Charles knew how much Mitsi loved her dog so she kept a diary, in Chubby’s voice, of his first weeks in the Bovee household, and then mailed it to Mitsi at camp. Mitsi died as a very old woman and when her family was cleaning out her apartment, they found that diary in her nightstand. I was struck by the fact that of all the horrible things that had happened to Mitsi, the thing she held onto was a symbol of kindness and compassion. That heart hook into the story, plus the fact that I am madly in love with my own dog and couldn’t imagine having to leave him behind, lead me to write Dash. JLC – Would you tell us a bit about your research, and give us a peek into your writing process? KL – Do you have all day? ;-) As a researcher, I leave no stone unturned. For example, when I read that snippet about Mitsi in Mr. Niewert’s book, I began to reach out to everyone I knew in the Japanese American community to see if I could find Mitsi’s family. I did and they generously provided me with stories, photographs, and other ephemera to help me understand what Mitsi went through. I listen to music of the time period I’m researching, dig up recipes, put together outfits my characters might have worn (Pinterest is great for this! ), and even scour second hand stores and eBay for old journals, letters and diaries to give me insights into the past. What I work hardest to find are primary resources – they are essential for helping me conjure up those delicious details that bring the past to life. As for my writing process, it is a huge mess! I just jump in and start writing – no outline. No plan. What I do first, however, is get to know my character as thoroughly as possible. My work is very character driven. Would you share the secret of writing historical fiction in a way that makes it personal and real for young readers? KL – I’m so flattered by this lovely review. I wish I knew the secret! What I do know is that if I don’t do my homework – really get myself grounded in a past time and place—I would never stand a chance of making history personal. JLC – #WeNeedDiverseBooks is an important and long-awaited topic in the book world right now. Thoughts? KL- I am thrilled this conversation is taking place. Children need to see themselves – deserve to see themselves! -- in literature of all kinds. I do have a worry, however, that “diversity” could come to mean only ethnicity. It would be a shame to set such limits. I’ve said this elsewhere: as a kid who grew up wearing hand me downs and sometimes finding the kitchen cupboards completely bare, I would have died and gone to heaven had I found books like Barbara O’Connor’s How to Steal a Dog or Janet Lee Carey’s The Double Life of Zoe Flynn, in which the main character is homeless. I hope and pray this #WeNeedDiverseBooks campaign leads to an even richer and broader range of the kinds of kid characters and stories we’ll see in children’s and young adult literature. JLC— What would you like readers to take away from this book? KL – I want readers to take away their own meaning from all of my books. But if Dash made readers stop and think about what it means to be a decent human being, I wouldn’t mind that one bit. 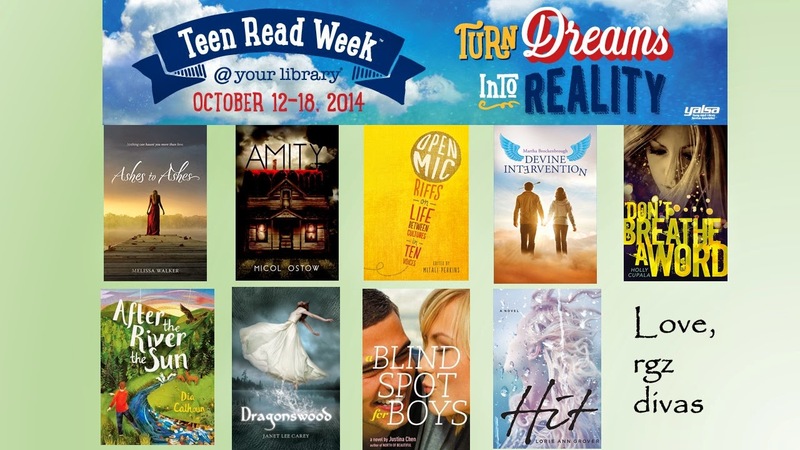 Happy Teen Read Week, rgz! This year's theme is "Empowering Adolescent Girls: Ending the Cycle of Violence." Amen to that! Bravo, to the United Nations for this intentional focus. 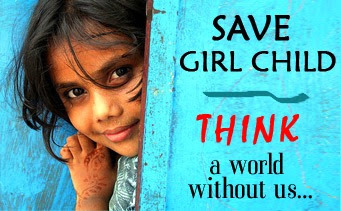 With their estimate of 200 million girls missing around the world due to gendercide, dowry infractions, and forced abortions of girls we need to stop and think and act. I created a collection of posters on Polyvore to draw attention to gendercide. You can see the full group of 30 by clicking here. Share them and raise awareness. Celebrate INTERNATIONAL DAY OF THE GIRL! 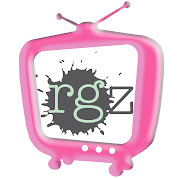 Read, reflect, and reach out, rgz! 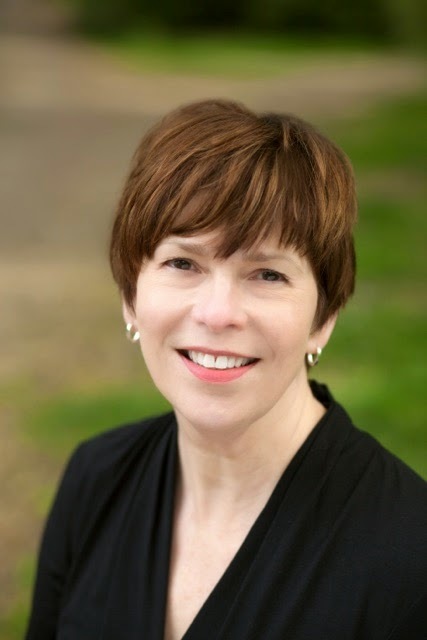 Lorie Ann Grover swings by readergirlz to chat with Janet Lee Carey about her new book HIT on its launch day! Welcome Lorie Ann. 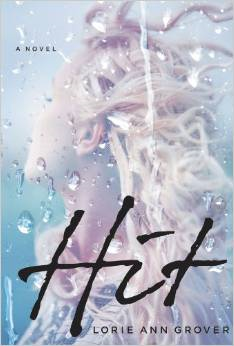 JLC -- HIT is a riveting read! Tell us what inspired you to write it. LG -- Thank you, Janet! HIT was inspired by a true story. Ten years ago, my daughter's best friend was hit in a crosswalk on the way to school. With her life threatened, her urgent brain surgery sent her family and friends spinning through a dark wait. Inspired by her experience, my novel tells the story of one girl struck down by the very grad student she is crushing on. Plans, goals, and dreams are shattered, as everything comes screeching to a halt. JLC – You chose to write the book in two viewpoints: Sarah, the girl who’s struck by a car, and Mr. Haddings, the young man who was behind the wheel. I was amazed by your choice which worked beautifully! Can you tell us when you decided to write the book this way and share some of the challenges faced? LG -- Well, it was originally six voices! JLC -- Who were they? LG -- Sarah, Haddings, Cydni, Luke, Janet, and Mark. Different editors along the publishing journey suggested reducing it to four, then finally two. Without introducing some sort of fantastic element, like Sarah wandering the hospital in spirit form, I needed at least two voices to tell the story as she is so long in surgery. JLC – You write so deeply and truly about family and family relationships in HIT. Can you give us a peek into your process for this? LG -- I think the real event was so charged and poignant, gestures, words, and phrases became haunting notes in my mind. It was simple to stream those straight into the novel. I also include the struggles I’m having or have had in the past: how to mother and let go, how to love the right person, how to separate your identity from another, etc. By digging deeply and bringing battles to light, there’s a chance the work will ring with a reader. JLC—They say every story is about character change. Sarah’s accident forces not only the central characters but every character in the book to change. How did you determine the way each of these unique personalities would change through the events of the story? LG --’d really like readers to consider the concept that within every hardship there are sweet red seeds. Like Dottie tells Sarah, under the leathery pomegranate skin, there is beauty. We just have to look for it. The truth lines up beautifully with Hit-and-Run: the Gratitude Tour. We're doing. Both Justina Chen and I tend to write about this. JLC-- The tour will bring out HIT and Justina Chen's A BLIND SPOT FOR BOYS. JLC -- Tell us more bout the tour! What we now realize is that our message is going to stretch beyond this tour across four states. 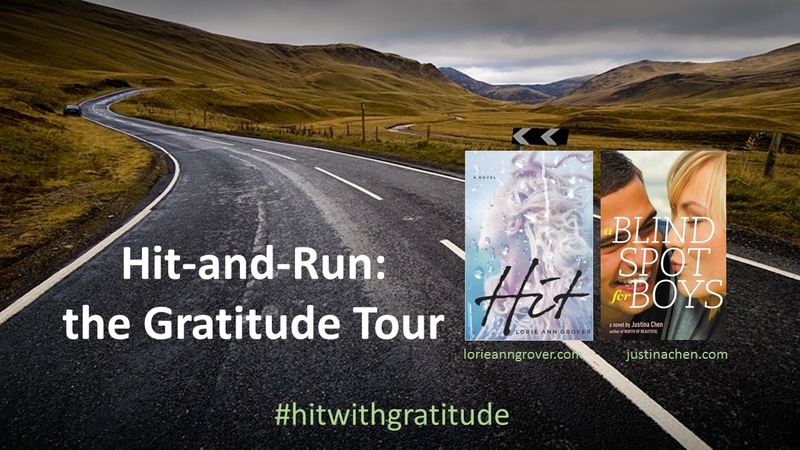 We will continue to hit the road, encouraging readers to #hitwithgratitude now and in the years to come. For example, how about a 30 Day Challenge to #hitwithgratitude daily through the month of November? Why not tweet, fb, and Instagram shout-outs for those you are grateful for? Who are the people who have crossed your life that you’d like to #hitwithgratitude? JLC -- I love this idea! LG -- There are so many ways we can encourage each forward, right? Let’s do it. I officially #hitwithgratitude: readergirlz and Janet Lee Carey!